He may be giving up his TT bike for a mountain bike but it’s not been done on a whim. 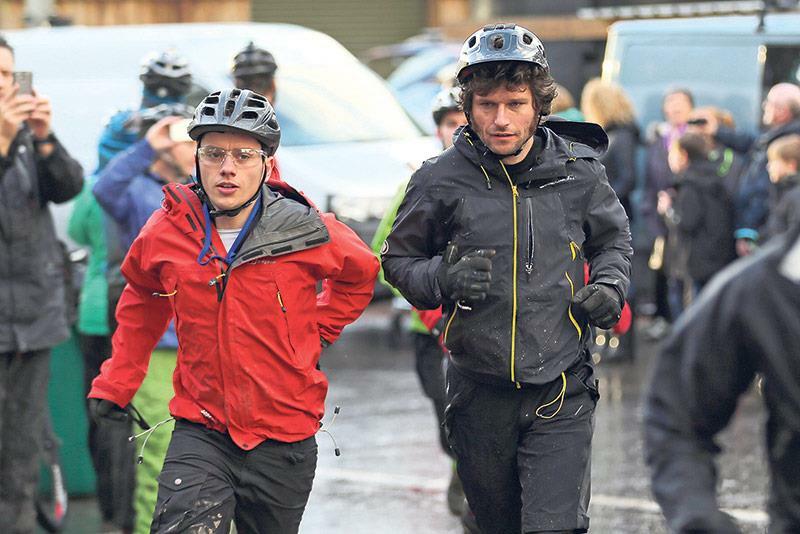 Last weekend Guy Martin cycled 500 miles to take part in a training race and MCN were there. uy Martin’s recent confirmation that he will be giving TT 2016 a miss has stunned the road racing paddock. Many fans have been left bewildered by his decision to abandon his Tyco BMWs and compete in a bicycle race in America instead. Guy had made no secret of his deep desire to ride in the Tour Divide event that follows a 2745-mile route between Banff in Canada and Antelope Wells in New Mexico, USA. Last weekend MCN found the Lincolnshire man hard at work, preparing for his latest challenge. 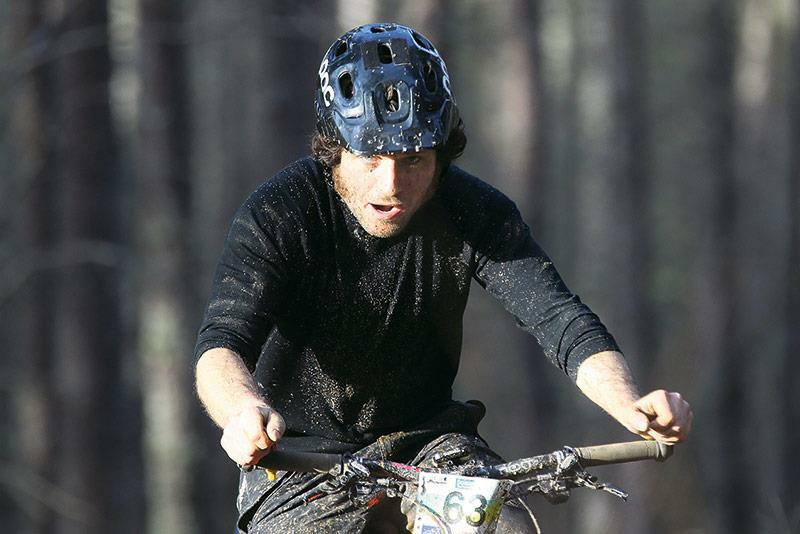 The 34-year-old has been a regular competitor in the Strathpuffer 24-hour mountain bike endurance race and last week he was once again amongst the 760 cyclists who competed on the 6.8-mile forest circuit near Inverness. 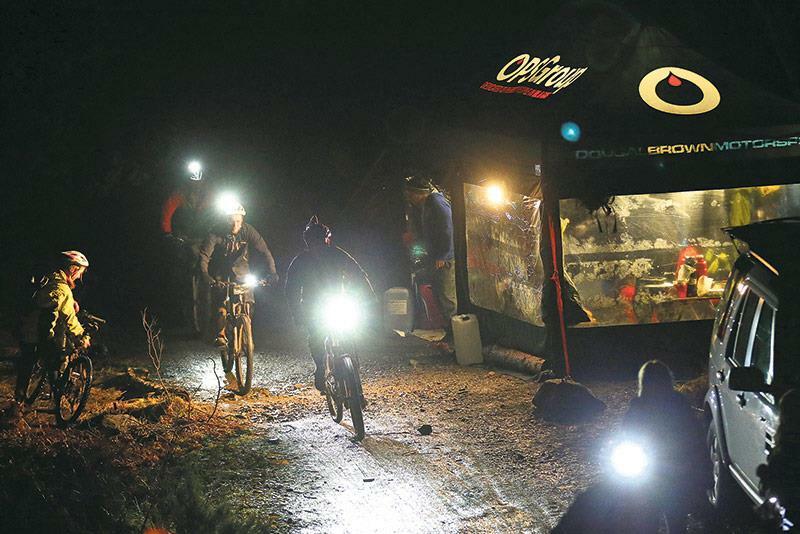 As a training run for the Tour Divide it is hard to imagine anything tougher than racing around a treacherous and muddy mountain track, including 14 hours in the pitch dark, but Guy had added a new level of difficulty to his 2016 challenge. “I left home last Wednesday and rode up here over three days,” Guy explained after the race as if riding an extra 500 miles in the three days before one of the world’s toughest mountain bike races was little more than a stroll in the park. Guy arrived in Inverness on Friday evening following a few hair-raising escapades along the way. “I had to bunk down for a couple of hours’ kip at the back of a forecourt in a Shell garage in Jedburgh on Wednesday night,” he laughed. Guy joked that he had also been mistaken for a potential suicide jumper on the Forth bridge after he ran across the road carrying his bike, but the odyssey had a very specific objective. If Guy is to complete the American event in June, and in a time that is close to the event record as he intends, he must be able to cycle at least 200 miles every day. Tour Divide competitors must be unsupported, carrying their own minimal food, clothing and bedding supplies as they follow a very specific route that they must not deviate from over the 2745 miles. His Kirmington to Inverness marathon was the latest instalment in a rigorous regime that is aimed at leaving him super fit for that superhuman two-wheeled challenge. “I’ve always cycled to work but now I set off an hour earlier and cover more miles,” Guy said of his daily 50-mile return trek to the haulage truck service centre in Grimsby where he works. “I’ll go out again for an hour or so at night just as I’m about to go to bed because I have to get myself used to pushing on even when I really don’t want to,” he explained. On his journey north, Guy used a single geared bike to help toughen up his leg muscles and joints even more. “You have to pull as hard as you push with that sort of set-up, especially climbing up all those hills into Scotland,” he smiled. 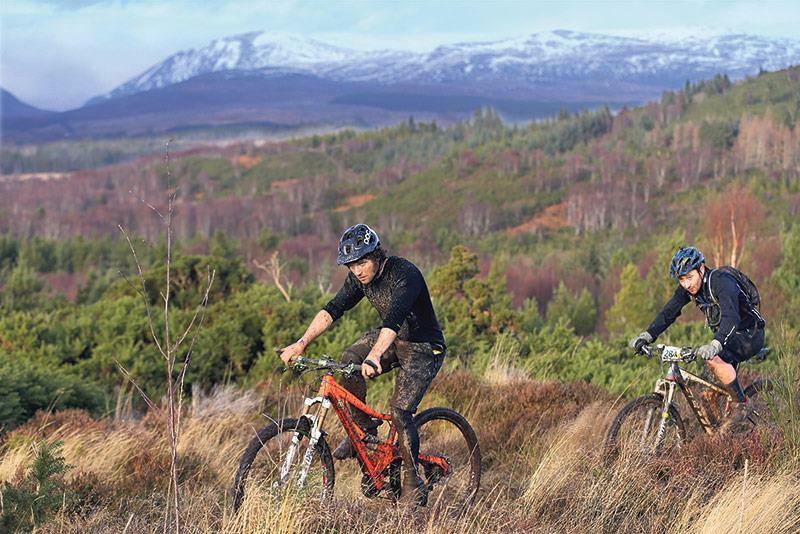 His Strathpuffer destination involved the beginning of 24 hours of something many of us would regard as yet another form of hell. Although there are teams of four and 10 riders competing together to share the burden of racing over tree roots and rocky outcrops for a full day, Guy was one of the 100 cyclists who choose to race the event solo. He has finished on the podium twice in his four previous appearances at the Scottish event, including a runner-up spot last year. 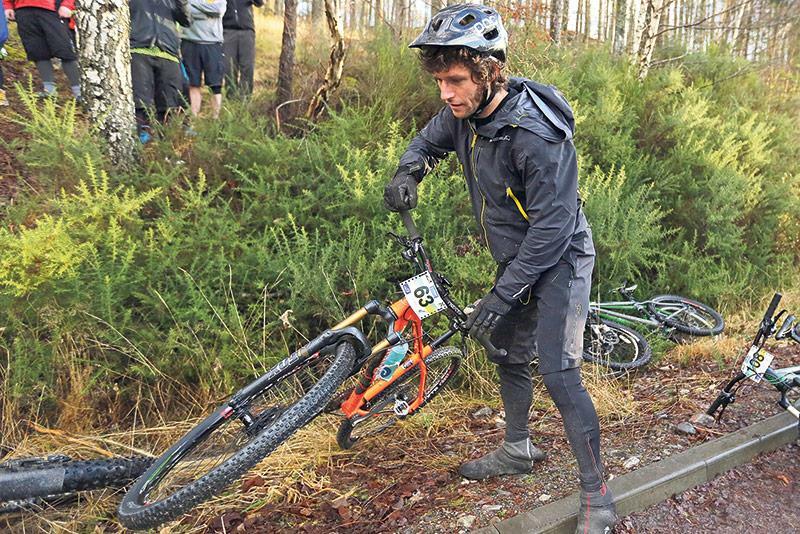 However, his exertions from cycling up to Inverness over the three previous days meant that he was never really in contention for such honours last weekend, but was still capable of running in the top 10 during the early part of the race. “I was not bothered about where I finished this year,” Guy explained as he pulled into his camp for a food break on Saturday evening, his face and body caked in mud. 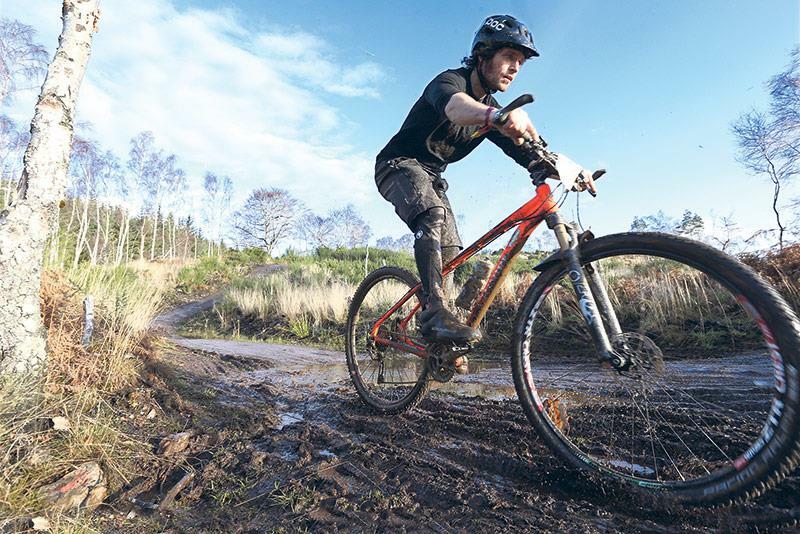 The unseasonably warm weather had made the Strathpuffer course exceptionally muddy, sucking the tyres into the mire and making the smooth rock surfaces especially treacherous. As racer after racer baulked at the challenge of some of the bigger drops or fell from their bikes on the ruts and potholes, Guy took it all in his stride. With his legs pumping like metronomes on the pedals, the Lincolnshire man hardly broke sweat as he shut out the pain to focus on the narrow path ahead. “It gets even narrower as you get tired but you have to put yourself through the pain and close yourself off from it if you are going to try to do what I want to do in America,” he explained. A podium finisher in the Le Mans 24-Hour motorcycle race in 2013 with the RC2L Suzuki squad, Guy knows all about the rigours of endurance motorcycle racing, but he says mountain bike racing is totally different. “Motocross is physical but I don’t know of anything in the motorcycle world that is as tough as this,” he declared as he rubbed ointment into his aching knees on Sunday morning. In the past Guy’s ability to concentrate for the two hours of a big bike TT race has been mulled over by pundits searching for reasons for his failure to win the one big motorcycle race that has so far eluded him. Guy agrees that although a fierce determination and concentration is required to succeed in races like Le Mans or the TT it is different to the way he approaches a race like Strathpuffer. “With Le Mans for instance it is not as physical but you do have to stay sharper all the time,” he agreed. So why does he want to do the Tour Divide so much that he is prepared to miss the TT? Is he going for glory in trying to break the 14 days and 20 hours record time? “If I can do it in two weeks I could win it but that might be a little unrealistic this year,” Guy ponders. “I have a lot to learn. “There is another race in Alaska I would like to try, and one called the Yak Attack in Nepal as well,” he adds. Guy even reveals he may like to try his luck in the Dakar rally in the future, but in a truck rather than on a motorcycle. So does this obsession with finding the limits of his resilience mean Guy Martin’s road racing days are completely over? “Maybe after I’ve tried the Tour Divide in June, I will have had enough,” he laughs. Martin to stay at Hydrex? Guy Martin: His best chance yet?